Aren't these fish fun? They are from Memory Box's Fish Tales. Rather than color in the images, I added drops of dye reinkers (and some gold paint) to watercolor paper and sprayed with a water bottle. Let dry, then stamp (making sure to leave some white spaces), and hand cut. So easy and fun. MOOD WHEN DONE = Great! Had a good weekend seeing friends and crafting. Today (Monday) I turn my attention to a growing list of chores that I've been avoiding. I was much more efficient with my time when I was working full time, mothering, and taking care of my mom! Hope you have a great week! I'm a BIG fan of the Memory Box notecards and keep a stock of the white ones (because I'm lazy) but also have some of their blues/greens/pinks. Didn't think of the black, thank you for that. Awesome color technique! 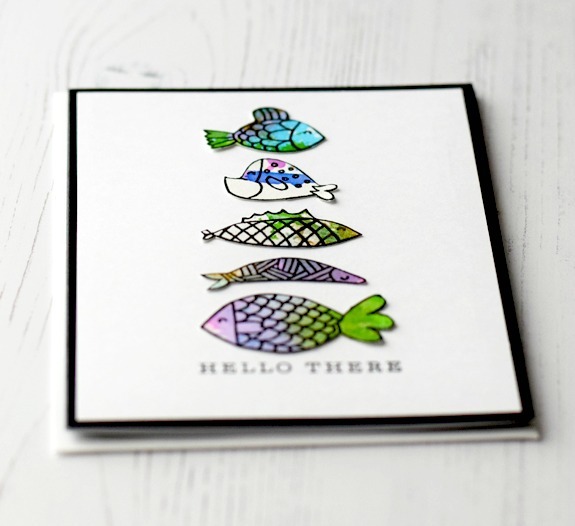 Fabulous fishy card! those fish are the cutest ever and such wonderful colors!! Fun fun! I pinned your card. Whimsical and happy! We need more whimsy and happy. Thank you. What a great technique! And I could tell instantly that you fussy cut the fish - the time and effort was definitely worth doing without that white border dies tend to leave. Beautiful card - I love it. And I get the lack of efficiency that comes with more spare time ... I am falling into the slacker category. 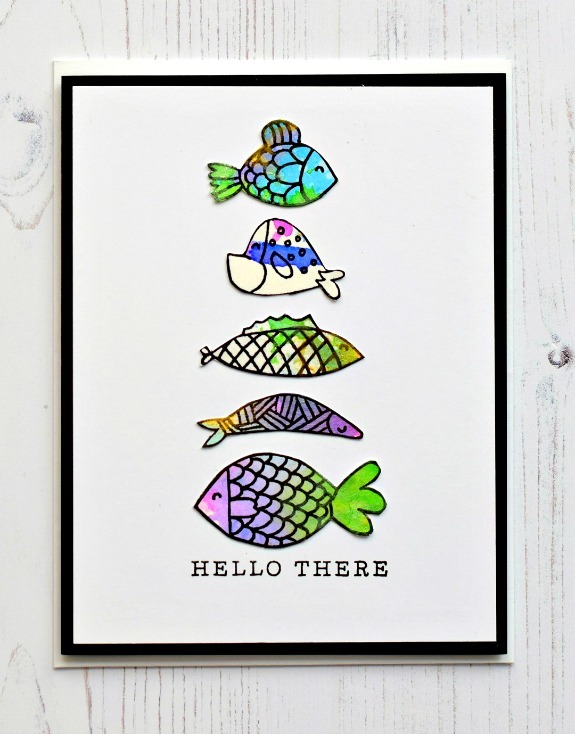 Okay... love the fish and your color method. I really need to play with backgrounds more. Filing this idea away. Also love Memory Box paper with its white on the back. The paper also has a smoother quality than other card stocks. I see most have matching envelopes, too. A person could spend some money there! Bookmarked. Hi Joan! Love this technique! What's great about it is it would apply to many stamp sets we may have. Love that! Also, wanted to let you know I'm am really enjoying all the goodies you sent me. Thank you again so much!